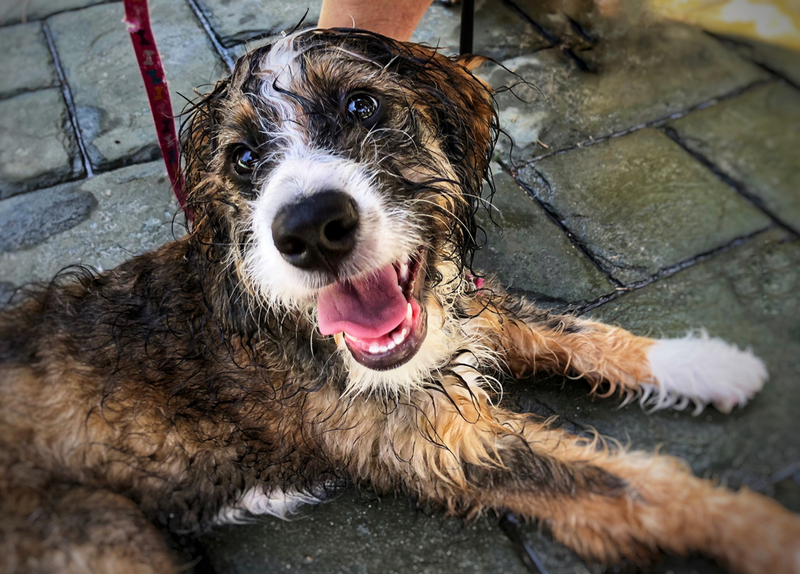 » Bernedoodle: The Ultimate Fun-Loving Companion? Are you looking for a dog who was bred specifically to be a fun-loving companion? While most purebred dogs were bred for a working purpose, Bernedoodles were bred simply to be energetic family dogs who can play all day and love their families to no end. 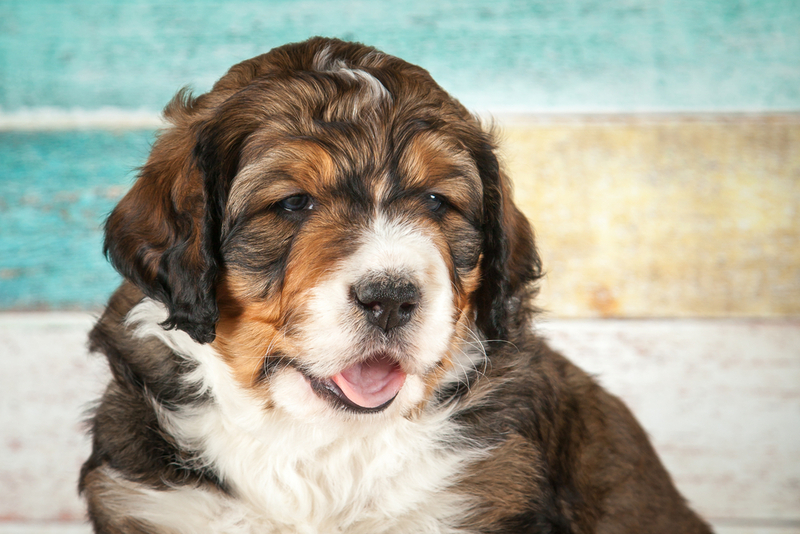 Is the Bernese Mountain Dog and Poodle mix right for your family? Let’s talk all about the Bernedoodle so you can decide whether you should add one to your family. The Bernedoodle seems to have been bred intentionally for the first time by Sherry Rupke of SwissRidge Kennels in Canada in 2003. She wanted to create a breed that had the laid-back personality of the Bernese Mountain Dog without the shedding, health problems, or short lifespan (the average lifespan of a Bernese Mountain Dog is only 8 years). As she has worked on perfecting this hybrid dog breed, other breeders around the world have started breeding Bernedoodles, and their popularity is steadily increasing. 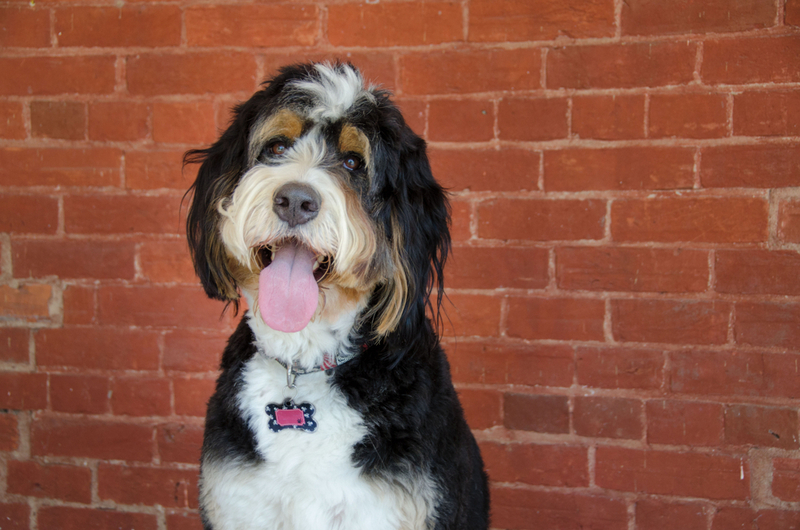 To better understand the Bernedoodle, let’s look at the history of the parent breeds, the Bernese Mountain Dog and the Poodle. The Bernese Mountain Dog is one of 4 breeds bred in Switzerland to act as all-around farm dogs, primarily on dairy farms. They would guard farmyards against predators, drove cattle, and pull heavy carts filled with milk. At the end of the day, they would act as companions for their families. Despite their association with France, the Poodle was developed as a duck-retrieving dog in Germany more than 400 years ago. In fact, the name “Poodle” is derived from the German word “pudelin,” which refers to splashing in water. Standard Poodles are the original size; from there, they were bred down to Miniature and Toy sizes for companionship rather than working. Bernedoodles come in 3 different sizes based on the size of the Poodle parent: standard, miniature, and tiny. Standard Bernedoodles are about 70-90 pounds, Mini Bernedoodles range from 25-49 pounds, and Tiny Bernedoodles are 10-24 pounds. That means that you can get the Bernedoodle personality in whatever size of dog best meets your lifestyle. Since Bernedoodles are hybrid dogs, you can never guarantee how their personality will turn out. The goal is to have a dog that has the intelligence of the Poodle with the happy-go-lucky nature of the Bernese Mountain Dog. However, you might also end up with a dog who has the stubbornness of a Berner with the hyperactivity of a Poodle. 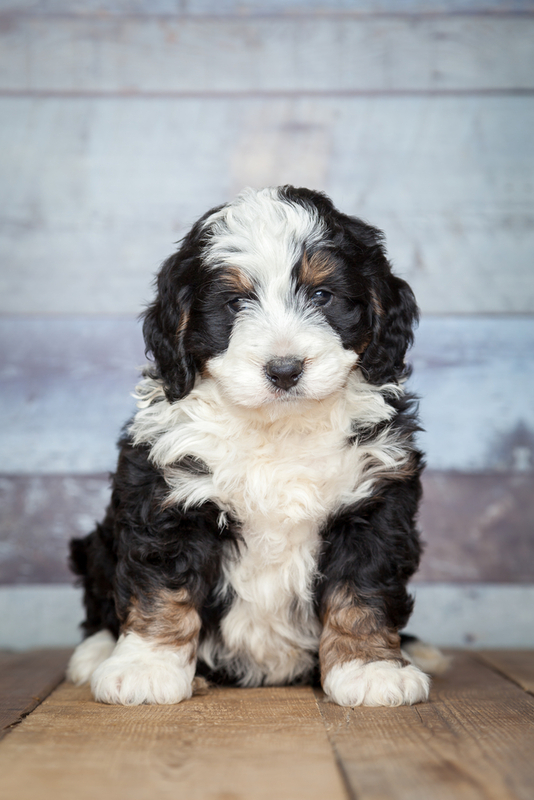 This is one reason you should look for a breeder who has thoughtfully bred several generations of Bernedoodles and knows how to improve the odds of puppies with ideal temperaments. Since Bernedoodles have been around for less than 20 years, there is not yet a good idea about the average lifespan of the various Bernedoodle sizes, and more health issues may be noted over the next decade or two. Bernedoodles have some special care considerations if you’re thinking about bringing one home. Pay special attention to their grooming and exercise requirements. Your Bernedoodle will have different food and diet requirements based on their size. Standard Bernedoodles benefit from a large breed dog food (like one of these) and puppy food to help them grow at a steady rate and maintain a healthy weight. Meanwhile, Tiny Bernedoodles may do better on food designed specifically for toy or small breed dogs. Regardless of size, Bernedoodles love to eat and are prone to obesity. Obesity causes a wide variety of health problems, so it’s important to keep your dog at a healthy weight. You should be able to feel your dog’s ribs without too much trouble, and they should have a waistline when viewed from above or the side. Since Bernedoodles are a hybrid of two different working breeds, they need a significant amount of exercise. Plan on spending at least an hour a day with your Bernedoodle going for a long walk, playing fetch in the backyard, or going to your local dog park. In addition to the risk of obesity, a lack of exercise can cause a Bernedoodle to become bored and destructive. Some Bernedoodles will inherit the stubbornness of their Berner parent, while others will inherit the intelligence of their Poodle parent, so it’s hard to say how difficult training will be. In any case, you should start training your Bernedoodle as soon as you bring them home so you can set them up for a lifetime of success. Several short training sessions per day with positive reinforcement seem to work the best when training Bernedoodles. Thanks to the lottery effect of genetics, some Bernedoodles will end up with the flat, shedding coat of a Bernese Mountain Dog, while most Bernedoodles have wavy or curly non-shedding coats. Regardless of coat type, you should plan on brushing your Bernedoodle several times a week. Bernedoodles that shed need regular brushing to removed undercoat, while those with more of a Poodle coat need regular brushing to avoid painful mats from developing on your dog, which can lead to the groomer being forced to shave your seemingly fluffy Bernedoodle. For more about which brush to use on your Bernedoodle and some helpful tips, check out the 13 Best Dog Brushes and Deshedding Tools for LARGE Dogs. Since Bernedoodles are a fairly new and rare breed, there are few, if any rescue groups designed specifically for Bernedoodles. If you have your heart set on rescuing a Bernedoodle, keep an eye on your local shelter and Poodle or Poodle Mix rescue groups. Many Bernedoodle breeders are hopping on the newfound popularity of the breed and are only interested in making a quick buck rather than creating healthy puppies, so it’s crucial to do your homework to find a breeder who does genetic and health testing on their breeding dogs to ensure the best chance of healthy puppies. It’s also important not to support puppy mills and pet shops that get their puppies from puppy mills. Even if you think you’re saving the life of the puppy that came from a puppy mill, you are supporting the puppy mill with your purchase, and you are much more likely to end up with an unhealthy dog. Here are answers to some of the most commonly asked questions about Bernedoodles. How much energy do Bernedoodles have? Bernedoodles have quite a bit of energy and need about an hour of exercise each day. Depending on your Bernedoodle’s temperament, they may enjoy a walk on a leash, a run around the dog park, a long game of fetch, or a good swim. Keep in mind that growing Bernedoodle puppies shouldn’t get much high-intensity exercise because it can affect their growing skeletal system. How big do Bernedoodles get? This all depends on what size of Bernedoodle you get. Standard Bernedoodles weigh 70-90 pounds, Miniature Bernedoodles weigh 25-49 pounds, and Tiny Bernedoodles weigh 10-24 pounds. Are Bernedoodles good family dogs? Generally, Bernedoodles make excellent family dogs! However, with a hybrid dog breed like the Bernedoodle, there are no guarantees; it all depends on the personality of the individual dog. No dog is truly hypoallergenic, because people are allergic to the dander or saliva of dogs rather than their hair. However, people with allergies tend to do better with dogs that don’t shed, like Poodles. Since Bernedoodles are usually at least half Poodle (More if they are a second or third generation), they do tend to be non-shedding and may be a good choice for those who have allergies. Can Bernedoodles live in apartments? Bernedoodles need quite a bit of exercise. If you can provide them with enough exercise without having a backyard, then they can adapt to apartment living. Miniature and Tiny Bernedoodles are better suited to apartment living than Standard Bernedoodles. Are Bernedoodles easy to train? Bernedoodles often get the intelligence of their Poodle parent, which can make them easy to train, although they may inherit the stubbornness of their Bernese Mountain Dog parent, which can make Bernedoodles a little harder to train. Use consistent positive reinforcement early and often, and you should end up with a well-trained Bernedoodle. Tri-color Bernedoodles that match the black, brown, and white of the Bernese Mountain Dog are the most sought after – but also rarest – coat color for Bernedoodles. More often, Bernedoodles are black, black and white, or black and brown. How long do Bernedoodles live? Since Bernedoodles are such a new breed, there isn’t a lot of information yet on the average lifespan of the breed. However, Standard Bernedoodles are thought to live to an average of at least 12 years old, while Miniature and Tiny Bernedoodles may live to be 17 and 18 respectively. 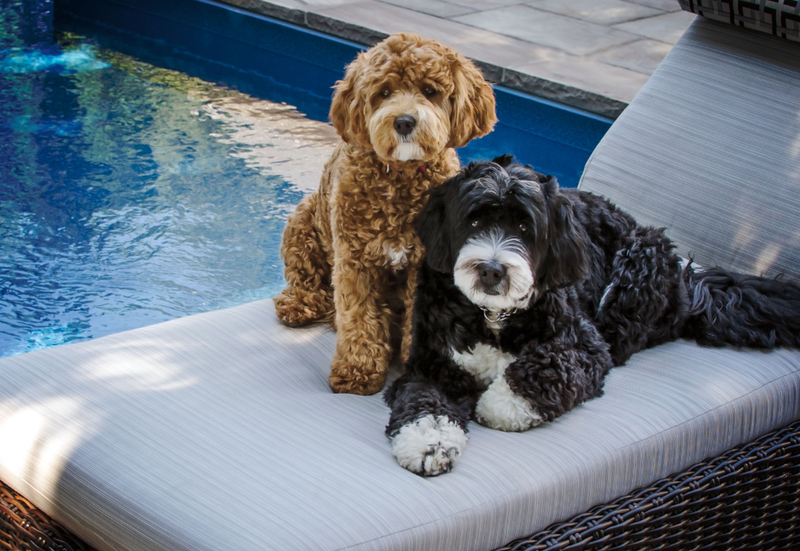 Wrapping Up: Is the Bernedoodle Right For Your Family? If they are well-bred and well-socialized, a Bernedoodle can make an excellent addition to most families. Before you bring one home, you should be sure that you can dedicate the necessary time to exercising and brushing them. They also need regular grooming, which can be quite expensive, especially for the Standard Bernedoodle. It’s also important to note that nothing is guaranteed when it comes to a hybrid dog like the Bernedoodle, especially since most Bernedoodles are first generation. You might end up with a non-shedding, super friendly dog, or you might get stuck with a high-shedding neurotic dog. With that being said, Bernedoodles generally make excellent family dogs and are usually a fun-loving breed who loves to spend time with their family. Love a Big Fluffy Dog? Check Out Our List of Large Furry Breeds!